China and the United States yesterday agreed to collaborate on developing electric and hybrid vehicles in a significant boost to the "green programs" expected to reshape the automobile industry. The collaboration comes at a time when US President-elect Barack Obama is heralding green cars as a crucial part of his energy strategy, while the Chinese government is also promoting these vehicles to cut the country's dependence on imported oil and reduce greenhouse emissions. The agreement, signed between China's Ministry of Science and Technology and the US Department of Energy, will see the two countries collaborate on battery performance, testing and evaluation methods, standards and codes, and lifecycle analyses, according to David Rodgers, deputy assistant secretary of the US Department of Energy. The US auto industry is being retooled for low-carbon-emission automobiles, either plug-in hybrids or pure battery-operated vehicles as Obama has called for an "end to the age of oil in our time" and hopes to see one million hybrid cars on the road by 2015. China has also laid out an ambitious blueprint. Wan Gang, minister of Science and Technology, said earlier last month China plans to put 60,000 new-energy vehicles for trial runs in 11 cities by 2012 for public transportation, public services & facilities and postal services. China currently imports nearly half of the oil required in the country. A recent McKinsey report has said the country is likely to double its oil imports by 2030 if the current growth rates continue. By promoting electric cars, the imports could be cut by around a quarter, it said. The Sino-US collaboration could benefit some Chinese companies such as BYD Co, which have been aggressively developing green cars. Chinese battery companies have been providing advanced lithium battery packages for testing at the national laboratory near Chicago in the US, said Rodgers. 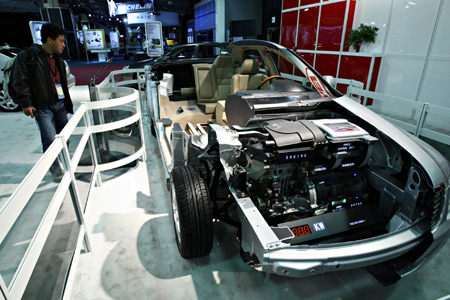 BYD Co, the world's biggest maker of mobile-phone batteries, plans to sell hybrid cars in the US by 2010.